The night before his assassination in April 1968, Martin Luther King told a group of striking sanitation workers in Memphis, Tennessee: “We’ve got to give ourselves to this struggle until the end. Nothing would be more tragic than to stop at this point in Memphis. We’ve got to see it through” (King, “I’ve Been to the Mountaintop,” 217). King believed the struggle in Memphis exposed the need for economic equality and social justice that he hoped his Poor People’s Campaign would highlight nationally. On 1 February 1968, two Memphis garbage collectors, Echol Cole and Robert Walker, were crushed to death by a malfunctioning truck. Twelve days later, frustrated by the city’s response to the latest event in a long pattern of neglect and abuse of its black employees, 1,300 black men from the Memphis Department of Public Works went on strike. Sanitation workers, led by garbage-collector-turned-union-organizer, T. O. Jones, and supported by the president of the American Federation of State, County, and Municipal Employees (AFSCME), Jerry Wurf, demanded recognition of their union, better safety standards, and a decent wage. 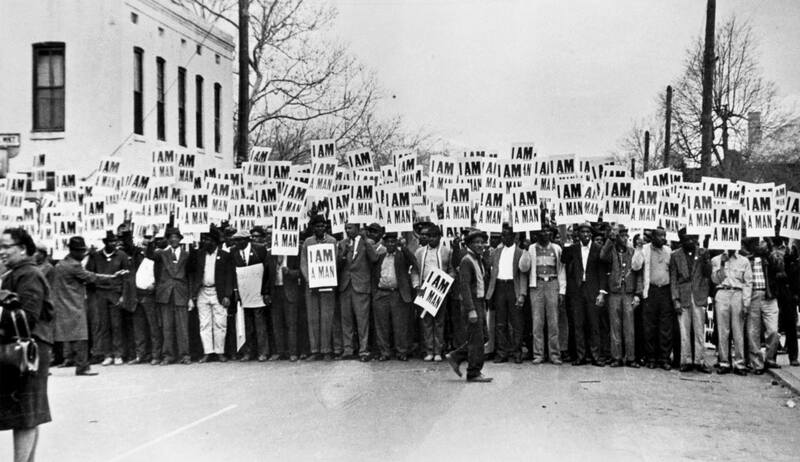 The union, which had been granted a charter by AFSCME in 1964, had attempted a strike in 1966, but it failed, in large part because workers were unable to arouse the support of Memphis’s religious community or middle class. Conditions for black sanitation workers worsened when Henry Loeb became mayor in January 1968. Loeb refused to take dilapidated trucks out of service or pay overtime when men were forced to work late-night shifts. Sanitation workers earned wages so low that many were on welfare and hundreds relied on food stamps to feed their families. On 11 February over 700 men attended a union meeting and unanimously decided to strike. Within a week, the local branch of the National Association for the Advancement of Colored People (NAACP) passed a resolution supporting the strike. The strike might have ended on 22 February, when the City Council, pressured by a sit-in of sanitation workers and their supporters, voted to recognize the union and recommended a wage increase. Mayor Loeb rejected the Council’s vote, however, insisting that only he had the authority to recognize the union and refused to do so. The following day, after police used mace and tear gas against nonviolent demonstrators marching to City Hall, Memphis’s black community was galvanized. Meeting in a church basement on 24 February, 150 local ministers formed Community on the Move for Equality (COME), under the leadership of King’s longtime ally, local minister James Lawson. COME committed to the use nonviolent civil disobedience to fill Memphis’s jails and bring attention to the plight of the sanitation workers. By the beginning of March, local high school and college students, nearly a quarter of them white, were participating alongside garbage workers in daily marches; and over one hundred people, including several ministers, had been arrested. While Lawson kept King updated by phone, other national civil rights leaders, including Roy Wilkins and Bayard Rustin, came to rally the sanitation workers. King himself arrived on 18 March to address a crowd of about 25,000 – the largest indoor gathering the civil rights movement had ever seen. Speaking to a group of labor and civil rights activists and members of the powerful black church, King praised the group’s unity saying, “You are demonstrating that we can stick together. You are demonstrating that we are all tied in a single garment of destiny, and that if one black person suffers, if one black person is down, we are all down” (King, 18 March 1968). King encouraged the group to support the sanitation strike by going on a citywide work stoppage, and he pledged to return that Friday, 22 March, to lead a protest through the city. King left Memphis the following day, but Southern Christian Leaderships Conference’s (SCLC) James Bevel and Ralph Abernathy remained to help organize the protest and work stoppage. When the day arrived, however, a massive snowstorm blanketed the region, preventing King from reaching Memphis and causing the organizers to reschedule the march for 28 March. Memphis city officials estimated that 22,000 students skipped school that day to participate in the demonstration. King arrived late and found a massive crowd on the brink of chaos. Lawson and King led the march together but quickly called off the demonstration as violence began to erupt. King was whisked away to a nearby hotel, and Lawson told the mass of people to turn around and go back to the church. In the chaos that followed, downtown shops were looted, and a 16-year-old was shot and killed by a policeman. Police followed demonstrators back to the Clayborn Temple, entered the church, released tear gas inside the sanctuary, and clubbed people as they lay on the floor to get fresh air. Loeb called for martial law and brought in 4,000 National Guard troops. The following day, over 200 striking workers continued their daily march, carrying signs that read, “I Am a Man” (Honey, 389). At a news conference held before he returned to Atlanta, King said that he had been unaware of the divisions within the community, particularly of the presence of a black youth group committed to “Black Power” called the Invaders, who were accused of starting the violence. King considered not returning to Memphis, but decided that if the nonviolent struggle for economic justice was going to succeed it would be necessary to follow through with the movement there. After a divisive meeting on 30 March, SCLC staff agreed to support King’s return to Memphis. He arrived on 3 April and was persuaded to speak by a crowd of dedicated sanitation workers who had braved another storm to hear him. A weary King preached about his own mortality, telling the group, “Like anybody, I would like to live a long life--longevity has its place. But I'm not concerned about that now… I've seen the Promised Land. I may not get there with you. But I want you to know tonight that we, as a people, will get to the Promised Land” (King, 222-223). The following evening, as King was getting ready for dinner, he was shot and killed on the balcony of the Lorraine Motel. While Lawson recorded a radio announcement urging calm in Memphis, Loeb called in the state police and the National Guard and ordered a 7pm curfew. Black and white ministers pleaded with Loeb to concede to the union’s demands, but the Mayor held firm. President Lyndon Johnson charged his Undersecretary of Labor, James Reynolds, with negotiating a solution and ending the strike. On 8 April, an estimated 42,000 people led by Coretta Scott King, SCLC, and union leaders silently marched through Memphis in honor of King, demanding that Loeb give in to the union’s requests. In front of the City Hall, AFSCME pledged to support the workers until “we have justice” (Honey, 480). Negotiators finally reached a deal on 16 April, allowing the City Council to recognize the union and guaranteeing a better wage. While the deal brought the strike to an end, the union had to threaten another strike several months later to press the city to follow through with its commitment. Honey, Going Down Jericho Road, 2007. King, "Address at Mass Meeting at the Bishop Charles Mason Temple," 18 March 1968, MVC-TMM. King, "I've Been to the Mountaintop," A Call to Conscience, ed. Carson and Shepard, 2001.